Bot. Jahrb. Syst. 25: 421. 1898. TYPE: Costa Rica. Rancho Hores in territorio Bacha, Volcán Barba, 2,100 m, Pittier 2295 (B, holotype; BR, G, isotypes). 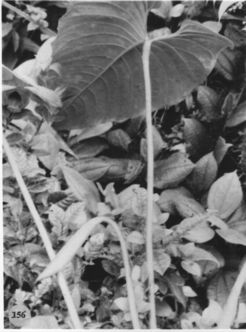 Anthurium vaLerii Standl., Publ. Field Mus. Nat. Hist., Bot. Ser. 18: 137. 1937. TYPE: Costa Rica. Here-dia: Vara BIanca, Valerio 1600 (F, holotype). Anthurium viniwior Standl. & L. 0. Wms., Cciba 3: 106. 1952. TYPE: Costa Rica. San José: Cordillera de Talamanca near Copey, cloud forest, 1.800 m, 23 April 1949, L. 0. Williams 16538 (EAR, holotype; F, US, isotypes). Epiphytic or terrestrial; roots thick, green, fuzzy, 3-7 mm diam., descending; cataphylls coriaceous, 13-30 cm long, apiculate at apex, drying tan (B & K. Yellow-red 9/2.5). persisting intact at apex, splitting at base of leaves. LEAVES with petioles erect-spreading, subtercte, shallowly and bluntly sulcate, 11-79 cm long, 5-15 mm diam. ; geniculum 1.5-3 cm long; blades narrowly ovate or ovate-deltoid, moderately thick, acuminate at apex, shallowly to deeply lobed at base, 17-64 cm long, 9-34 cm wide, broadest between base and midway; the anterior lobe 12-29 cm long; the posterior lobe 7-13 cm long from sinus to outermost point; the sinus arcuate to parabolic; both surfaces semiglossy; midrib convexly raised above, diminished and sunken at apex, convexly raised below; primary lateral veins 4-9 per side, departing midrib at 40° angle, raised above and below; secondary veins conspicuous, sunken above, prominulous below; basal veins 3-6 pairs, the first pair usually free to the base, the third to sixth coalesced 1-2 cm, the fourth to sixth coalesced 3.5-6 cm; posterior rib naked, turned up; collective vein usually arising from one of the primary lateral veins, sometimes from the first basal vein, erect to weakly sunken above, raised below, 3-9 mm from margin. INFLORESCENCE erect-spreading, much shorter than leaves; peduncle 13-56 cm long; spathe subcoria-ccous, lanceolate to narrowly ovate, green, tinged with purple on inner surface, 4-35 cm long, 2-6.5 cm wide; spadix sessile or with stipe 1.6-2.5 cm long, dark violet-purple, 3.5-19 cm long, 0.9-1.5 cm diam. at base, 6-9 mm diam. at apex; the flowers rhombic, 2-3.2 mm long, 2.6-3 mm wide, the sides jaggedly sigmoid; 5-10 flowers visible in the principal spiral, 7-20 flowers visible in the alternate spiral; tepals matte, lateral tepals 1-1.8 mm long; pistils green; stigma linear, ca. 0.5 mm long; lateral stamens emerging throughout, followed by alternates, exserted on flat filaments ca. 0.5 mm long, ca. 1 mm wide; anthers white, ca. 0.6 mm long, 0.7 mm wide: thecae ovoid-cllipsoid, slightly divaricate; pollen white. INFRUCTESCENCE arching-pcndent; spadix to 50 cm long, to 3 cm diam. ; berries orange, narrowly obovoid, acute at apex, to 14 mm long. Figs. 155 and 156. Anthurium ranchoanum is found in Costa Rica and Panama at elevations of 500-2,300 m (usually above 1,000 m), usually in tropical wet, premontane rain, and lower montane rain forest life zones. The species is an atypical member of section Pachyneurium and is recognized by its thick, ovate to ovate-triangular blades, with heavy, rather numerous veins, obtusely sulcate petioles; ovate to lanceolate, green, hooding spathe, tinged with purple; dark violet-purple, relatively stubby, scarcely tapered spadix with tight clusters of white stamens; orange berries; and especially by the fruiting spathe, which is stiffly erect. Also characteristic is the way the spadix is turned downward at anthesis. The source of the collective vein is variable, arising from first basal veins or, more frequently, in Costa Rica, from one of the primary lateral veins and, in Panama, from the first basal veins or primary lateral veins but more frequently from the lower basal veins. The species is most easily confused with A. cotobrusii, which sometimes has similar leaves. The latter can be distinguished by its stiffly erect, conspicuously tapered spadix and prominently reflexed spathe. The species is also related to A. colonicum K. Krause and A. nervatum Croat (ined. ), both from Panama; and to A. spectabile, which ranges from Nicaragua to Costa Rica. 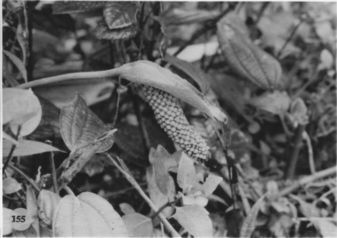 The latter species has similar leaves (especially when dried) and a similar inflorescence but differs in having usually more or less pendent leaves, and an elongate, more or less thin, spreading spathe, whereas A. ranchoanum has leaves more or less erect and a spathe that is more nearly ovate, thick, and stiffly erect. Anthurium colonicum has similar leaves but differs from A. ranchoanum in its reflexed and prominently undulate-margined and often contorted spathe, sharply protrudent, early emergent pistils, and narrowly oblong-elliptic, sharply pointed berries. Anthurium nervatum dif-fers in having a reflexed spathe and a spadix that is usually much longer and more gradually tapered. Costa Rica Alajuela: 1480 m, 10.02N 84.28W, 18 November 1988, Michael Grayum, Gerardo Herrera & Randy Evans 9092 (MO). Costa Rica Alajuela: 2000 m,, 24 Dec. 1974, Luteyn et al. 4502 (MO). Costa Rica Alajuela: 1850 m,, 25 May 1976, Thomas B. Croat 35466 (MO). Costa Rica Cartago: 2000 m,, 14 Oct. 1978, António 721 (MO). Costa Rica Cartago:, , Williams & Allen 16538 (US). Costa Rica Cartago: Cordillera Talamanca, 2650 m, 09.34.30N 83.41.10W, 2 Mar 1996, Picado & Gamboa 345 (INB, MO). Costa Rica Cartago: Cordillera Talamanca, 2650 m, 09.34.30N 83.41.10W, 2 Mar 1996, Gamboa & Picado 384 (INB, MO). Costa Rica Cartago: Cordillera Talamanca, 2760 m, 09.33.55N 83.40.55W, 6 July 1996, Gamboa & Picado 440 (MO). Costa Rica Guanacaste: Monteverde, 1350 m,, 7 Feb 1979, Thomas B. Croat 47130 (MO). Costa Rica Guanacaste:, , Lellinger & White 981 (US). Costa Rica Heredia: 2000 m, 10.10.58N 84.06.24W, 15 August 1992, Brad Boyle 1018 (KYO, MO). Costa Rica Heredia: 2060 m, 10.01.30N 84.07.00W, 18 April 1986, Michael H. Grayum 7226 (MO). Costa Rica Heredia: Cerro Chompipe, 2100-2200 m, 10.5N 84.4W, 4 Sep 1979, Stevens 13980 (MO). Costa Rica Heredia: Río Vueltas, 2000 m, 10.6N 84.4W, 22-24 Nov 1969, Burger & Liesner 6369 (MO). Costa Rica Heredia: Río La Paz Grande, 1270-1350 m,, 22 June 1976, Thomas B. Croat 36052 (MO). Costa Rica Heredia: 1200 m,, 22 June 1976, Thomas B. Croat 36053 (MO). Costa Rica Heredia: 2100 m,, 25 Jan. 1970, Lent 1898 (MO). Costa Rica Heredia: P.N. Braulio Carrillo, 1700-2000 m,, March 1983, Gomez 20225 (B, CR, F, K, MO). Costa Rica Heredia: P.N. Braulio Carrillo, 1800 m,, 24 Feb 1983, Gomez 20103 (CR, MO). Costa Rica Heredia: 2000-2100 m, 10.7N 84.5W, 8 Dec 1975, Baker et al. 239 (MO). Costa Rica Heredia: 1600-1800 m,, 27 June 1972, Luteyn 3275 (MO). Costa Rica Heredia: 1720 m,, 5 Feb. 1937, Rojas 511 (MO). Costa Rica Heredia:, , Lellinger & White 1012 (US). Costa Rica Heredia: Cerro Chompipe,, , Luteyn & Wilbur 4422 (DUKE). Costa Rica Heredia:, , Utley & Utley 4564 (DUKE). Costa Rica Heredia:, , Pittier 14058 (US). Costa Rica Heredia:, , Standley & Valerio 50243 (US). Costa Rica Heredia:, , Standley & Valerio 50798 (US). Costa Rica Heredia:, , Standley & Valerio 51455 (US). Costa Rica Heredia:, , Standley & Valerio 51620 (US). Costa Rica Heredia:, , Standley & Valerio 52345 (US). Costa Rica Heredia: Volcán Barba,, , Lems s.n. (NY). Costa Rica Heredia: Volcán Barba,, , Pittier 2295 (BR). Costa Rica Heredia: Volcán Barba,, , Skutch 3657 (MICH, US). Costa Rica Heredia: Cerro Chompipe, 2000 m,, 29 Aug 1964, Lems s.n. (MO). Costa Rica Heredia: 1900-2100 m., 10.05N 84.05W, 25 Mar. 1982, Barringer & Schatz 2039 (MO). Costa Rica Heredia: P.N. Braulio Carrillo, 1830 m, 10.11.50N 84.06.35W, 7 Nov 1986, Herrera 242 (MO). Costa Rica Heredia: P.N. Braulio Carrillo, 1800 m, 10.11.50N 84.06.35W, 9 Nov 1986, Herrera 266 (MO). Costa Rica Heredia: P.N. Braulio Carrillo, 2000 m, 10.11.35N 84.06.15W, 6 Nov 1986, Herrera 228 (MO). Costa Rica Heredia: 2500 m, 10.07.30N 84.08.00W, 19 April 1990, Gerardo Rivera 194 (MO). Costa Rica Heredia:, , Lems s.n. (K, NY). Costa Rica Lim—n: 1350 m, 9.47.18N 83.08.45W, 19 April 1989, Gerardo Herrera & Abelardo Chacón 2663 (MO). Costa Rica Lim—n: 1600 m, 9.47.20N 83.07.30W, 24 April 1989, Gerardo Herrera & Abelardo Chacón 2755 (MO). Costa Rica Lim—n: P.N. Cordillera de Talamanca; Cordillera de Talamanca, 1500 m, 09.21.23N 83.13.40W, 19 March 1993, Alvaro Fernandez 733 (CR, INB, MO). Costa Rica Lim—n: P.N. Cordillera de Talamanca; Cordillera de Talamanca, 2250 m, 09.24N 83.11W, 1 April 1993, Alvaro Fernandez 963 (CR, INB). Costa Rica Lim—n: P.N. Cordillera de Talamanca, 1700 m, 09.23.20N 83.12.20W, 28 Mar 1993, Fernandez, A. 867 (INB). Costa Rica Puntarenas: Canton de Coto Brus, 1200 m, 08.49N 82.58W, 6-7 March 1984, Croat 57242 (MO). Costa Rica Puntarenas: Las Cruces Botanical Garden,, , Thomas B. Croat 44443 (MO). Costa Rica Puntarenas: 1450 m, 10.20N 84.50W, 5 JAN 1986, William A. Haber 4086 (MO). Costa Rica Puntarenas: 1450 m, 10.20N 84.50W, 5 JAN 1986, William A. Haber 4087 (MO). Costa Rica Puntarenas: 1000 m, 10.20N 84.50W, 9 MAY 1986, William A. Haber ex Eric Bello C. L. Lieheimer 5016 (MO). Costa Rica Puntarenas: 1000-1400 m, 10.07.50N 84.40.25W, 30 noviembre 1986, Gerardo Herrera Ch., D. González, M.V. García P.Morton 295 (MO). Costa Rica Puntarenas: Monteverde, 1150-1250 m, 10.18N 84.48W, 29 Jan 1991, Haber & Zuchowski 10487 (MO, CR). Costa Rica Puntarenas: Monteverde, 1100-1200 m, 10.17N 84.48W, 26 Jan 1991, Haber & Zuchowski 10468 (MO, CR). Costa Rica Puntarenas: 1700 m,, 24 August 1985, William A. Haber 2393 (MO). Costa Rica Puntarenas: 1450 m, 10.20N 84.50W, 5 JAN 1986, William A. Haber 4071 (MO). Costa Rica San José: Río Cascajal, 1680 m,, 26 Sep 1971, Lent 2181 (MO). Costa Rica San José:, , Utley 407 (DUKE). Costa Rica San José:, , Luteyn 3324 (DUKE). Costa Rica San José:, , Standley & Valerio 44077 (US). Costa Rica San José:, , Standley 41767 (US). Costa Rica San José:, , Tonduz 12266 (G, US). Costa Rica San José:, , Tonduz 12267 (B, US). Costa Rica San José:, , Tonduz 12269 (US). Costa Rica San José: P.N. Braulio Carrillo, 1700-2000 m,, Mar 1983, Gómez, L. 20190 (MO). Mexico :, 15 Mar. 1993, Hodel 1185 (MO). Panama Bocas del Toro: Cerro Pate Macho, 1200-2100 m,, 27 May 1981, Sytsma et al. 4949 (MO). Panama Bocas del Toro: 1500 m, 8.35N 81.50W, 8 Jul. 1988, Croat 69211 (CM,MO). Panama Chiriquí: 08.50N 82.44W, 28 February 1985, Henk van der Werff & J. Herrera 7275 (MO, PMA, RSA). Panama Chiriquí: Cerro Pando, 2000-2300 m, 8.55N 82.44W, 15 Oct. 1981, Knapp 1653 (K, MO). Panama Chiriquí: Fortuna Dam Area, 1000 m, 8.45N 82.12W, 13 March 1982, Knapp et al. 4177 (MO). Panama Chiriquí: Cerro Hornito summit, 2100 m, 8.42N 82.6W, 14 March 1982, Knapp et al. 4202 (MO). Panama Chiriquí: Cerro Pate Macho, 2200 m, 8.47N 82.21W, 15 March 1982, Knapp et al. 4240 (MO). Panama Chiriquí: Cerro Horniqueta, 1860-1940 m, 8.49N 82.29W, 2 Jan. 1975, Cochrane et al. 6264 (MO). Panama Chiriquí: Cerro Horniqueta, 1660-1930 m,, 13 Dec. 1966, Herrera 545 (MO). Panama Chiriquí: Cerro Pate Macho, 2200 m,, 23 Nov. 1979, Thomas B. Croat 48519A (CM, MO). Panama Chiriquí: Cerro Pate Macho, 1800-2200 m,, 23 Nov. 1979, Thomas B. Croat 48553 (MO). Panama Chiriquí: Cerro Hornito summit, 2230 m,, 15 Feb. 1979, Hammel 6217 (MO). Panama Chiriquí: Cerro Hornito, 1400-1750 m,, 27 Dec. 1977, Folsom et al. 7224 (MO). Panama Chiriquí: Fortuna Dam Area, 1370 m, 8.43N 82.15W, 8 Apr. 1980, Thomas B. Croat 49846 (MO). Panama Chiriquí: Fortuna Dam Area, 1200-1400 m,, 21 March 1978, Hammel 2113 (MO). Panama Chiriquí: Cerro Punta, 2200 m,, 27 Feb. 1973, Liesner 326 (MO, PMA).
. Panama Chiriquí: Cerro Horqueta,, , Dwyer et al. 545 (GH, MO, US). Panama Chiriquí: 800 m, 08.53N 82.35W, 28 March 1993, Thomas B. Croat 74888 (MO). Panama Chiriquí: 1750-1900 m, 8.41N 82.10W, 22 Sep 1987, Croat 67985 (MO). Panama Chiriquí: Fortuna Dam Area, 1300 m, 8.45N 82.15W, 11 March 1986, Gordon McPherson 8779 (B, MO, NY, PMA). Panama Chiriquí: 1800-1950 m, 8.46N 82.25W, 19 June 1987, Croat 66407 (MO, US).